The times when concrete was merely a boring building material are over! It has been rediscovered for the living space with versatile concrete accessories for modern and classic interior design. 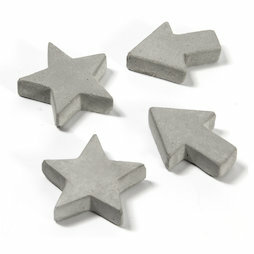 Hence, these decorative magnets made of real concrete will make a great impression in your living or office space. Embedded in the concrete is a neodymium magnet, which easily holds several A4 sheets.